If true, the reported concessions that Israel is being asked to make as part of the US administration's "deal of the century" will not be perceived by the Palestinians as a sign that Israel seeks peace. As the past has proven, they will be viewed by the Palestinians as a form of retreat and capitulation. Worse, the Palestinians are likely to use the four neighborhoods as launching pads to carry out terror attacks against Israel to "liberate the rest of Jerusalem." Is it appropriate and helpful to reward Abbas and his associates at a time when he is refusing to stop payments to Palestinian terrorists and their families, and at a time when they are continuing to incite their people against the US administration, Ambassador Nikki Haley, and its Jewish advisors, Jason Greenblatt, Ambassador David Friedman and Jared Kushner? Is this a man who deserves to be rewarded? Is this a man who deserves to be brought into Jerusalem? Abbas, and not Israel, ought to be asked for concessions. He should stop denying and distorting Jewish history, he should stop rewarding Jew-killers; he should stop preaching hate to his people. That is the best path to peace. For decades now, Palestinians have interpreted Israeli concessions and gestures as signs of weakness. This fact is important to bear this in mind as the US administration prepares to launch its plan for peace in the Middle East, which President Donald Trump has referred to as the "deal of the century." "The principles of the peace plan, which were presented to Liberman, include, among other things, large-scale and significant concessions on the part of Israel... the US expects Israel to accept the plan and to come to terms with what the Israelis perceive as painful concessions." The Palestinian Authority would be happy to assume control over the four Arab neighborhoods in Jerusalem. As far as the PA is concerned, the more territory it is handed by Israel, the better. Territory in Jerusalem is especially welcome as it would give the Palestinian Authority a foothold in the city. A foothold, that is, for much, much more. The four neighborhoods are only a few miles away from the Knesset, the Prime Minister's Office and other symbols of Israeli sovereignty. Thus, Palestinian sovereignty over the four neighborhoods is of symbolic importance. Make no mistake: the Palestinians will see their presence in the four neighborhoods as the first step towards the redivision of Jerusalem. The Palestinians will say that these Israeli concessions are not enough. They will demand that Israel hand them control over all 28 Arab neighborhoods and villages that are located within the boundaries of the Jerusalem Municipality and are under Israeli sovereignty. In other words, the handing over of the four communities will only whet the Palestinians' appetite and drive them to demand more. The Palestinians will argue that Israel has now created a precedent that needs to be followed by further concessions. Here, it is worth noting that the Palestinian Authority is demanding sovereignty over all of east Jerusalem, including the Old City and the Western Wall. For them, the Old City and all the holy sites in Jerusalem belong to the Palestinians and should all be under Palestinian sovereignty. They will take the four neighborhoods, but that will just be the beginning. Even worse, the Palestinians are likely to use the four neighborhoods as launching pads to carry out terror attacks against Israel to "liberate the rest of Jerusalem." Let us consider what happened in 2005, when Israel unilaterally withdrew from the Gaza Strip after evicting more than 8,000 Jews from their homes and destroying more than 20 settlements. Even today, it is hard to find a single Palestinian who regards the Israeli withdrawal from the Gaza Strip as an indication that Israel wants peace. On the contrary. The Israeli "disengagement" from the Gaza Strip was misinterpreted by the Palestinians as a retreat in the face of suicide bombings and rocket attacks. For the Palestinians, the Israeli withdrawal from the Gaza Strip was perceived as a capitulation that emboldened Hamas and other terror groups. These groups took credit for "driving the Jews out of the Gaza Strip" through terrorism. If shooting Israelis worked and drove the Israelis to retreat, good: Keep doing it! It is no wonder, then, that Hamas won the Palestinian parliamentary election a few months later. Hamas ran in the January 2006 election on a platform that boasted that it had forced Israel to "flee" the Gaza Strip through suicide and rocket attacks. Back then, Palestinians in the Gaza Strip said: "This is wonderful, we have killed 1,000 Jews in four years and these Jews run away from the Gaza Strip, so we need to continue shooting at them. Today, they run away from the Gaza Strip. Tomorrow they will run away from Ashkelon, then from Ashdod, then from Tel Aviv, and from there to the sea, and we will achieve our goal of eliminating Israel." Needless to say, Hamas and its supporters continued to launch attacks against Israel after the Israeli withdrawal to the international border. They truly believed that the Israeli "disengagement" was nothing but surrender in the face of violence. The talk now about an Israeli withdrawal from parts of Jerusalem will bring us back to the Gaza Strip scenario. First, no Palestinian will see such a step as a positive gesture on the part of Israel. Second, why would anyone think that these neighborhoods will not fall into the hands of Hamas and Palestinian Islamic Jihad in the future? That is exactly what happened in 2005, when Israel handed the Gaza Strip over to the Palestinian Authority, which later ran away, and handed it over to Hamas. The timing of the proposed Israeli concessions is also highly problematic. Palestinian Authority President Mahmoud Abbas and his Ramallah-based government and associates are currently engaged in an unprecedented campaign of incitement against Israel. They are continuing to spread venomous lies about Israel and incite their people to hate and violence. They are continuing to reward terrorists and their families for killing and maiming Jews. They are continuing to deny any Jewish history and connection to the land, and they are doing their utmost to delegitimize and demonize Jews. Hardly a day passes without Abbas remaining us that he is not a partner for any peace agreement with Israel. Is it wise to reward Abbas now that he has exposed his true anti-Semitism? Is it appropriate to give Abbas a foothold in Jerusalem after he recently claimed that it was, according to him, the Jews' behavior, and not anti-Semitism, that caused the Holocaust? Is it appropriate and helpful to reward Abbas at a time when he is refusing to stop payments to Palestinian terrorists and their families? Moreover, is it appropriate and helpful to reward Abbas and his Palestinian Authority at a time when they are continuing to incite their people against the US administration and its Jewish advisors, Jason Greenblatt, David Friedman and Jared Kushner? Does the Palestinian Authority deserve to be rewarded for its daily incitement against US Ambassador to the United Nations, Nikki Haley? There is a saying in Arabic: "They spit in his face but he calls it rain." Haven't the Palestinians already dismissed President Trump's plan as a "conspiracy aimed at liquidating the Palestinian cause and national rights?" Why should the Trump administration give Abbas gifts at a time when he and his friends are boycotting US officials? The Trump administration needs to understand that the Palestinians view the US as an enemy, not as a friend. Giving Abbas control over four Arab neighborhoods in Jerusalem will not advance the cause of peace. No Palestinian will take to the streets to express gratitude to Israel. Instead, they will take to the streets to intensify their terror attacks on Israel in the hope of extracting further concessions. Abbas has proven that he is no different than his predecessor, Yasser Arafat. Like Arafat, he too does not recognize Jews' right to the land, any land. Just look at any current map of "Palestine": it is an exact duplicate of the map of Israel, but with the names of some cities changed. Abbas does not aim for control over some areas just in Jerusalem. For Abbas, as for Arafat, Israel is one big settlement that needs to be removed. For him, in his own words, Israel is a "colonial project" that he claims has nothing to do with Judaism. For him, the Jews are nothing more than the greedy moneylenders, parodied in caricatures, who brought the Holocaust on themselves. Muslims are taught from birth the saying, "Beware of your friends. They may be your enemies tomorrow." As such they trust no one but they expect everyone to trust them. In exchange they betray any trust placed in their empty words of peace. They have on goal and one goal only: the total and complete annihilation of Israel, Europe, and the US. Nothing short of that is acceptable. Now how do we get our governments to realize that and stop wishing for something that never will be? We should have learned our lesson from Neville Chamberlain. Appeasement doesn't work, never has worked and never will work. Only the utterly and complete destruction of the ideology of the Islamic caliphate will bring us peace in our time.In WWII it took the atomic bomb to destroy the ideology of the divinity of the Japanese emperor to bring about the post-war peace in the Far East. Maybe we should stop playing nice and do the same in the Middle East. The new "Deal of the Century" is just the kind of posturing Mr. Trump is very accomplished at. Give, in order to, get!?! Only someone who has everything he or she wants or needs, would ever find that kind of diplomacy realistic. Could be, he and the other players have an ace up their sleeve....but, I sincerely doubt it. This is what I call the foreign diplomacy-politics of the businessman! The need for PEACE cannot be measured in Economic terms or devised through profitable circumstances. Peace, the absence of conflict, in this geopolitical region requires a total shift in the human experience of forensic history. Courts of law in democracies everywhere understand this phenomenon and utilize the truth in forensic scientific proof to establish anyone's innocence or quilt. Incase no one has noticed, the Palestinians and extremists everywhere in the Middle East, don't act on fact....only the passionate politics of fiction that falsely tries to tear down the reality of the truth. History shows us rules that govern war and peace; If you show weakness you will sooner or later be attacked. You will have war while your attackers live. You can only end war by fighting until your attackers are all dead. You may extend peace by showing strength. No more concessions to these Arabs, please! Look what happened when Israel gave up Gaza! There is already a large "palestinian" state east of the Jordan. It comprises territory which was originally given to the Jews to create their homeland. Let us not give in to the pestering of the greedy Palestinians who clearly aim to divide what was left of Israel in half and then destroy the land completely. The elephant in the room remains the absolute mandate of Islamic sacred texts for the annihilation of the Jews that necessitates the destruction of Israel. The International Community cannot or will not grasp that the Palestinians will never in good faith accept the existence of Israel because doing so would represent directly ignoring Allah's rulings. Arafat rejected every peace proposal offered by Israel solely because he knew that he would be promptly murdered by observant Muslims if he agreed to a Middle East containing Israel & its hated Jews. The continuing existence of Israel in the heart of the Islamic world (as Muslims see it), is experienced by Muslims as a constant, painful humiliation before Allah & Muhammad that must be eliminated by any means possible, including by nuclear holocaust. Failure to understand & overcome this fundamental obstacle to peace, will lead to eternal war. This conflict reminds me of the Irish Protestant & Catholic in Northern Ireland. Although the flames have subsided, there are still embers. Maybe its because they have "separate but equal" schools for their kids. Yep 1950s USA. One school for the Catholic & one for the Protestant. I think there is a lesson here for Israel and the PA.
Gen 21:10 Therefore she said to Abraham, "Drive out this maid and her son, for the son of this maid shall not be an heir with my son Isaac." The Jews own the Mid East; let the "Palestinians" go back among the Arab countries, where they belong. If the Palestinians and the their fanatic brethren had shown any attempt at being rational human beings over the past seventy years maybe I would listen. As it is....I don't really care what the Palestinians want. They are finished and so are the fanatics.....done. over. Jordan was 85% of the British mandate of Palestine until it was carved out and given to the Hashemite family of Saudi Arabia as a gift in 1922. Jordan is critical to solving the Palestinian problem. Jordan should be encouraged to join with most of the West Bank and the Gaza strip to reconstitute 90% of the historic land called Palestine by the Brits. The people of Jordan are Palestinians, and could readily accept their fellow Palestinians as free citizens of Jordan. Even now Palestinian Arabs are eligible for Jordanian citizenship and passport if they ask. Israel will feel much more comfortable dealing with Jordan than with the corrupt and violent Palestinians leadership in the WB and Gaza. There is no end to the demands on Israel. The idea of having a permanent gaggle of homeless Arabs ( who have co-opted the moniker of Palestinian ) is to be a leverage against Israel. The Palestinians are just garden variety Arabs who had a home in Jordan but were booted out for troublemaking in that country. Would nay country want to admit a people who hate your culture and religion and will never be loyal?....Wait a minute we are doing that here in the US. The way things are set up right now, either a future Palestinian state or Israel will not be contiguous. Not acceptable. Therefore, one of the groups must move or be moved. Since Israel is only holy site for Jews, they stay. Islam has other holy sites besides Jerusalem. The new Palestinian state will be in the Sinai. Egypt should cede the land for this group. Move all the Palestinians from the West Bank and Gaza there. Dismantle the Dome of the Rock and carefully reassemble it in the Sinai brick by brick. The Jews then occupy the West Bank. Gaza gets leveled and becomes an agricultural buffer zone for the Jews. The Hebrew word Shalom means Peace, exactly. The Arabic word Salam means "cessation of fighting as the conflict is at stalemate, and the situation needs to be put up with until the situation changes". There is no word for "peace" in the western meaning. I do not blame the Palestinians for wanting more territory anymore than I blame Jews who want all of Jerusalem while ignoring the 1/3 rd of the population that is Muslim and Palestinian and hope to make their part of Jerusalem a capital in the second state. If there is any blame it is that the Palestinians are not proceeding in good faith to establish their state in the two state solution but are schooling their children to be terrorists for generations to come until all the Jews are disposed of and there is no longer an Israel. They deserve much blame for their bad faith; Islamist bigotry. Agree 100%. Any capitulation by Israel is perceived as weakness by Palestinians and exaults Abbas' failing political influence. There already is a Palestian state in the Middle East and it is called Jordan. There is zero possibility that Israel would even contemplate making the suggested concessions. 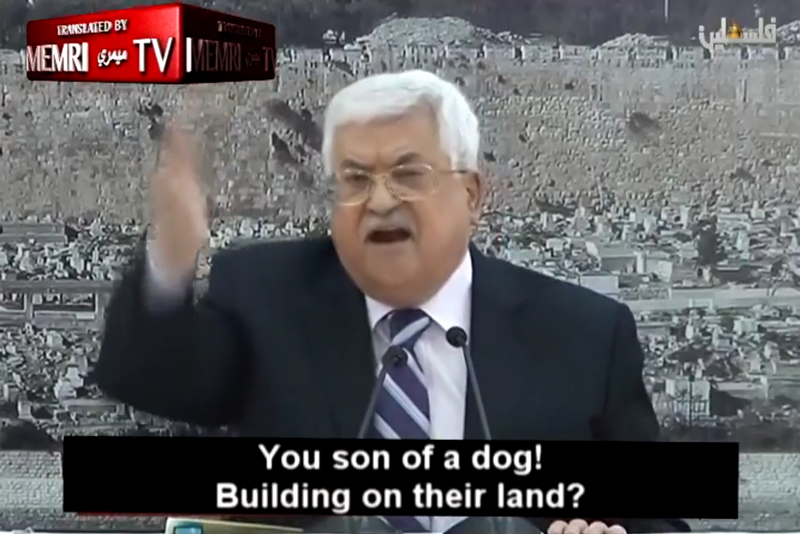 Abbas wants to burn Israel to the ground. You can't negotiate with the devil. The Islamist mind refuses to grasp the Western concepts of treaty or truce. They grasp only this; utterly, implacably destroy our eternal enemies, or die trying. "Peace" to them is all non-Muslims enslaved or dead. This is the best article I've ever read on this topic. The pals never concede on anything. It's always the Israelis who must. The pals reward (literally) terrorists. They "educate" their children that the Jews are descendants of pigs and monkeys, who must be killed. So the next generation is filled with hatred and ignorance, just like the prior generation. Lather, rinse, repeat. Does any Gatestone reader or writer or editor, know how to get this article read by Trump, Pence, Pompeo and every US Senator and member of the House? I fear too many on our side believe that negotiations are possible, when they are NOT, unless and until we (and at times, the Israelis) stop being idiots. Do our leaders know how the allies beat Germany and Japan in WW II? It was not making ever more offers of concessions to Hitler and Tojo! It was making them quit the war. Before a peace agreement can be implemented, Arabs governing the west bank should remove the clause that punishes its inhabitants with death for the sale of land to Jews. I have no idea what Trump has in mind, but there will be no peace until the PA is eliminated, along with Fatah, Hamas, and the rest of the terrorist groups. A Palestinian state, or further concessions of land are not an answer to anything. Whatever they control will be no different than what they control now, and used as a base for continuing attacks on Israel. The refugee camps have to be broken up, and their populations given citizenship rights in the neighboring Arab states. They need to be dispersed, and understand that they are where they are, there is no right of return. The terrorist organizations have to be destroyed by whatever means are necessary, and terrorist activities made punishable by death, or they will never be controlled. Israel will have to resume rule over Palestinian territories, with a large degree of local autonomy, but under fairly and strictly enforced Israeli law. Arabs who choose not to live under Israeli law should be encouraged to leave, and given financial assistance to do it, under conditions that they not return. There is no way to make peace with the present Palestinian structure. They have no interest in peace, only preserving their own power and eventually destroying Israel -- they will have to be eliminated, and kept from re-forming, or nothing will change. Why does Israel continue to make deals with the enemies? If the Muslims countries see any deal made by Israel as a weakness, then perhaps Israel needs to stop being Mr. Nice Guy and take out their enemies for good. Also they need to tell the US and Europe to bug out of their business and allow Israel to defend herself. Mr. Bassam Tawil, you are perfectly right in your analysis (100%). The Israeli Jews, the Americans and the Trump Administration in general, as well as the Europeans do not understand well our neighbors, even though people like you are explaining again and again. You raised all the points that had to be raised again. This will bring again suffering, death and injuries, fears and despair. For the effects of withdrawals, we have the Gaza withdrawal as an example. Do they need another one? All this will lead us closer to Gog and Migog. It seems that the Trump Administration is also looking for Gog and Migog or even the Jewish members of the peace team did not understand anything. Like Jews and Christians who believe in the Prophets of the Bible, those Muslims who are G.d-fearing people, will easily understand this question: "what prompts you to enlist in the hordes of Gog and Magog? "Upon the day when their faces are turned about in the Fire they shall say, 'Ah, would we had obeyed God and the Messenger!' They shall say, 'Our Lord, we obeyed our chiefs and great ones, and they led us astray from the way. Our Lord, gives them chastisement two fold, and curses them with a mighty curse". Qur'an, Sura Ahzab ("The Confederates"), 33:66 (Arberry translation, page 435) (standard numbering: 33:66-7)." That will certainly not be the business deal of the century! After all, the whole world is in such a state that we may think that it deserves this. Those who have read my book, The Middle East and World War III - Why No Peace? already understood what can lead us to peace. Even though some of the Trump Administration received my book, they did not have time to read it apparently looking only for a deal (of the century). According to Islamic culture, any piece of land secured by Islamic conquest stays Islamic, no matter for how long, where, and who occupies it, be it Israel or anyone else. Spain to the Muslims is known as "Iberia" and according to Muslim culture will one day be back in their hands. Land means a whole lot more to a Muslim than it means to any Westerner.